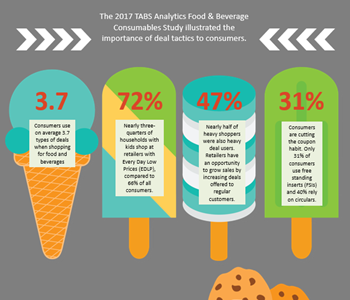 In August 2018, TABS Analytics rounded up comprehensive data to delve into specific food and beverage industry trends as they relate to consumables. This information outlines shopping patterns and trends, including online grocery trends, snack food trends, organic food trends and other highly detailed statistics specific to the food and beverage industry. Since 1998, marketers in the food and beverage industry have relied on the detailed analytics of TABS research, founded by Dr. Kurt Jetta in 1998, to track consumer shopping habits and trends. Our technology-enabled analytics firm aims to simplify and improve the way analytics for consumer products are conducted through innovation to provide our clients with a strong, competitive advantage. And our techniques get results — TABS is a leading outsourced sales and marketing analytics firm in the consumer-packaged goods (CPG) industry. For a brief overview of the state of the food and beverage industry trends for 2018, however, just read on. Shelton, CT – October 17, 2018 – Food and beverage categories have seen a meaningful increase over the last two years, as many major retailers saw same store sales rise thanks to an increase in median income and a low unemployment rate, according to the TABS Analytics 6th Annual Food and Beverage Consumables Study. 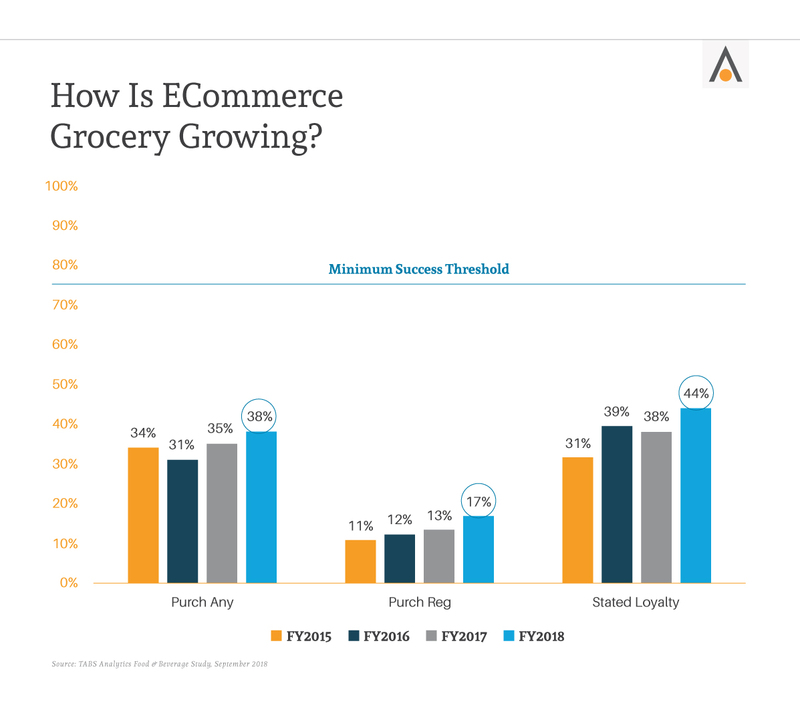 The study identified solid share gains for online grocery but found that the format is still a small player in the $800 billion industry, accounting for less than 5 percent of sales. Be sure to watch the recording of our 2017 Food and Beverage Study webinar where we reviewed these points, and more, in detail. Even though eCommerce still only accounts for a small portion of sales in the food and beverage market, the ability for consumers to purchase items on the web and then pick them up at a local retailer has been driving online shopping growth in the U.S. during the past year. While U.S. online sales increased by 13 percent since 2016, this channel is still just a drop in the bucket compared to the predominance of brick-and-mortar retailers. And it has a long way to go before it can be considered a success – like eCommerce is in the U.K. – based on established retail loyalty norms. That’s just one of the findings that TABS CEO Dr. Kurt Jetta shared last month when releasing the results of the TABS Analytics 5th Annual Food and Beverage Consumables Study, which for the first time expanded to include analysis of the U.S. and U.K markets. The study looked at similarities and differences that exist between the two countries, and if any U.K. trends could potentially foreshadow things to come in the U.S.
Shelton, CT – September 25, 2017 – Online grocery shopping’s share of trips in the U.S. has grown 13 percent over 2016, according to TABS Analytics’ Fifth Annual Food and Beverage Consumables Study. 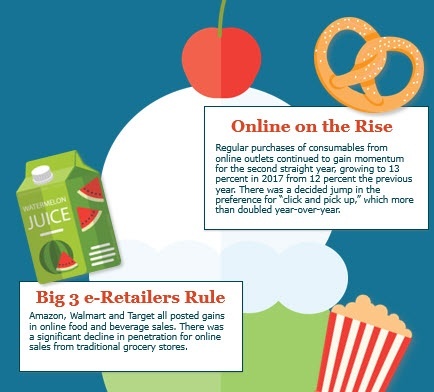 Although regular online shopping has increased, it is still eclipsed by the 98 percent of consumers who reported shopping in brick and mortar grocery outlets for foods and beverages (also known as consumables). For the first time, the annual TABS study analyzed the U.K. food and beverage market and found that online grocery shopping accounts for 8 percent of all shopping trips, which is more than double the U.S. number of 3.6 percent.